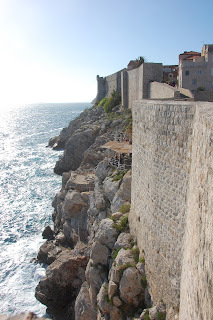 We ended our epic Easter Break trip with the beautiful walled city of Dubrovnik. When the weather is nice, this place is phenomenal. This is a view from our rented apartment (roughly) of the old town. It was a stronghold for centuries against the Venecians and the Ottomans and was brought to public attention during the war for independence in the 90's because the Serbian army shelled this city from the surrounding cliffs. Inside the walls, Marisa is hanging out on the main drag through the old town. Here's one of the gates above the former moat on the western side of the city. By some stroke of luck we wandered around the inner edges of the walls until we came across this little gem - a cliffside bar through the wall with a great view of the surrounding coast. One of the highlights in Dubrovnik has to be the walk along the top of the city walls. The view from one corner of the walls gives you an overview of the layout of the old town and the size of the perimeter. Many of these buildings suffered damage from incoming mortars during the siege. We had gone our separate ways during the day, but chance brought us back together along the walking path on the walls. It's a small town after all. 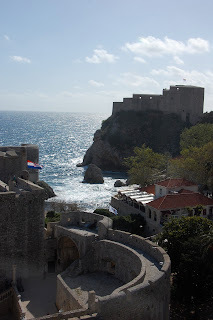 I must say that we were very fortunate to have the weather on the day that we decided to walk around Dubrovnik. Normally there are large cruise ships that dump their passengers off to terrorize the town and clog up the wall walkway. We had another day in Dubrovnik with the cruisers with rainy weather, which resulted in hundreds of umbrellas cramming through the narrow alleys and sidestreets - not as fun. So this was our last stop on our trip through Croatia. We were also able to take a day-trip into Montenegro, which turned out to be less-than-impressive. Again, it was a rainy day and the wait-time driving across the borders is absolutely insane. I suppose that can be attributed to the high volume of goods and stolen vehicles that cross the borders of the countries in this area. To summarize, I think that Croatia is a lovely country, but definitely much more so when the weather is nice (like anywhere). While many of our colleagues have claimed Croatia as their favorite place to visit in Europe, we didn't get the same vibe. If I come back I think that I would check out more of the islands, as that is where a lot of people visit - and it might be a better idea to go in the summertime.